The Chronicle of Cultural Misandry: Fathers Are Discriminated Against by Society and Medicine. Fathers Are Discriminated Against by Society and Medicine. One would think that men, who supposedly had all the power back in the 1800's and early 1900's, would have no opposition to their rights as fathers to be present in the birth room with their wives, but as one takes interest to find out how things really were back then, he would eventually find that expecting fathers were easily dismissed by hospitals and their policies. Here's a young husband who chained himself to his wife in a hospital to prevent from being removed from watching his child's birth and supporting his wife in her hour of need. In here, in this 1960 article from the Lewiston Morning Tribune September 26. It clearly states that only a few hospitals allowed fathers to have access to their wives and children in maternity wards. Also stated on the paper that psychologists suggested a father who wanted to be present, were better fathers, but the biased hospitals suggested that only psychopaths would want to see women in labor pain. Seems like projection considering doctors tied women down in hospitals and left them for days even. 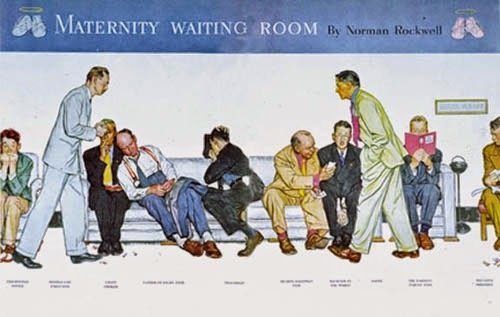 Some doctors were advocating for father's rights to be in the rooms because it was beneficial according to doctors. We can read how mothers also wanted their husbands in the birthing rooms with them, and Dr. Carl Goetch from Berkeley, also stated that wives can derive strength from the support from their husbands, to the point of requiring medication, makes couples bond more and doctors have a better condition practicing their skills. Despite couples receiving support from society and practitioners, some other states still discriminating against fathers in the maternity wards, causing some couples to travel in order for fathers to experience their children's births; As it is the with the case of Ken Conner and his wife Iva Conner, who after losing a court battle in Florida to have Ken permitted in the birth room, had to travel 3.000 miles to California, where the previous paper Reading Eagle showed us how fathers were winning their rights in previous years. We can see how the judge didn't even allow the couple to testify. In the book called Make Room for Daddy: The Journey from the Waiting Room to Birthing Room, it tells us how fathers were only allowed in "Husbands' waiting rooms", where men who were impatiently waiting on news on their wives and children co-miserated together and were treated as buffoons by hospitals for doing so. This view of fathers being ostracized from participating in their wives' deliveries, depends on the society. Ancient societies, husbands would assist their wives in child birth; they would press on her contracting womb to assist the women on pushing out the child, tying the umbilical cord and biting it off. Source: The Pre-History of Midwifery. By I. HARVEY FLACK, M.D. Here's how dismissive advice columns such as Dear Abby to expecting fathers and their lack of rights of participation in the process of childbirth. A lot of this bigotry and and belittling of fathers is really unwarranted considering men did have participation in the birth of their children in ancient civilizations before midwifery by female family members and friends took over that role, which helped bar men from participating. Even though studies have shown that men can be nurturing and supportive towards their wives -to the point of being considered the most important type of support- health professionals still display indifference or give less attention towards expecting fathers. When fathers suffered from anxiety, wives were also seen to suffer from such; and men also found themselves as less supportive. Better professional help is required in order to help couples in the experience of bringing their child into the world, but sadly, most health professionals only see the father as necessary after birth.